THE Innotech Guardian Safety System uses patented technology to facilitate radio communication, telemetry, and incident control for firefighters. The system consists of three independent components that can be purchased separately, as budget allows, or as a completely integrated system. * Innotech Guardian-Coms - a high quality BA and helmet communications device. * Innotech Guardian-ICU - a computerised Incident Control Unit. 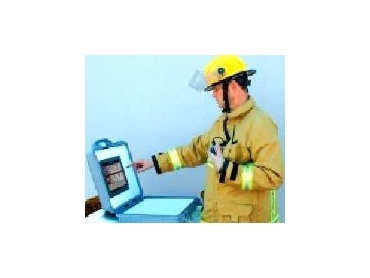 * Innotech Guardian Safety System - the ultimate in firefighter accountability and incident control. The first component of the Innotech Guardian Safety System is a high quality communications device allowing clear and reliable communications. It may be fitted to the majority of leading helmets and breathing apparatus. The Guardian-Coms represents an innovative improvement in firefighter communication systems, by providing an effective interface between the user and the radio in hostile firefighting and emergency environments. * Seamless integration with any firefighting ensemble. * Integrated design allows rapid donning of PPE. * Versatile design features allow for efficient retro-fitting to all leading helmets and breathing apparatus. * Does not compromise helmet functionality, performance or comfort. * Built to conform to Australian Communications Authority requirements. * Tested to withstand the rigours of firefighting environments. * Performs well in high ambient noise environments. * Functional with or without hearing protection. * Optional integrated man-down alert that sends a system wide signal to indicate a firefighter is in distress. The second component of the system is a computerised Incident Control Unit (ICU) capable of monitoring fireground activities such as BA control, incident control and firefighter accountability. This information is then relayed via a wireless network of control units. The Guardian-ICU provides a user-friendly tool to enable effective management of diverse and complex emergency situations. * A user-friendly interface consisting of a robust touch screen system designed to withstand the rigours of the fireground. * Reliable electronic means of logging personnel and appliances on to the fireground (electronic T-Card). * Fully compliant with the Australian Incident Command System (ICS). * Integrated base station radio for effective fireground communication. * Integrated wireless network hardware enables real-time sharing of vital data between all Guardian-ICU's. While the Guardian-Coms and the Guardian-ICU are capable of standing alone as separate devices, it is only through the addition of a suitably compliant Telemetry Unit that the full potential of the Guardian concept may be realised. The Guardian Safety System is the ultimate in firefighter accountability. Incorporation of telemetry systems enables real-time monitoring of the vital factors affecting firefighter safety. * SCBA Cylinder air pressure and real-time consumption rate monitoring allows for dynamic calculation of the actual "time due out". * Rapid location of firefighters down via locater beacon. * Real-time tracking of all firefighter movements. * Real-time relaying of critical data to individual firefighters.